The University of California-Santa Barbara suspended an accused student based on physical abuse claims that his non-student accuser recanted before the Title IX investigation started. It did not lift the “interim” suspension, which prevented “John Doe” from starting his freshman year, until a judge ordered it to let him back on campus with no restrictions in spring 2017. Santa Barbara Superior Court Judge Thomas Anderle said the university’s conduct through the process was “arbitrary and unreasonable.” UCSB fully exonerated Doe more than a year later. Yet the public university will pay Doe less than $5,000 for the trouble it has caused him since fall 2016. In an Oct. 23 order, Anderle flatly rejected a motion by Doe’s attorney for nearly $465,000 in “private attorney general fees” under California law. The statute is intended to reward plaintiffs who enforce “an important right affecting the public interest” that helps a “broad class of citizens,” as if they were acting as attorney general. Doe’s lawyer Bob Ottilie said in a press release that he’s appealing the denied attorney’s fees to a state appeals court. The student is also appealing Anderle’s summer ruling that rendered his lawsuit moot, according to Ottilie. Doe and the judge disagree on whether the suspension has actually been cleared from his record. The Title IX proceeding involved Doe and his ex-girlfriend, who was never a student at UCSB and attended another college in San Diego County. Doe alleged that she blackmailed him as he headed to UCSB, threatening to release a video of them in a “scuffle” if he talked to females on campus. She eventually tweeted an edited version of the video with the aim of “protect[ing] other women from being battered.” The video gave the impression that Doe hit her as the screen goes dark and only audio can be heard. Informed of the video by another UCSB student, the university sent its campus police to San Diego to arrest Doe. Margaret Klawunn, vice chancellor of student affairs, immediately suspended Doe without hearing his side of the dispute. His girlfriend never filed a complaint. Within days a San Diego judge determined Doe was not a threat to anyone. The district attorney dropped two charges shortly thereafter, and another judge dropped the third after Doe’s ex-girlfriend admitted “he had not hit her,” Anderle’s summary says. But despite the dropped charges and the ex-girlfriend’s admission, UCSB opened a Title IX proceeding and kept Doe suspended for the next several months. Anderle originally denied a stay of the suspension because it wasn’t a “final administrative order,” but a state appeals court overturned him. That led the trial judge to grant Doe’s sought injunction. Anderle blasted UCSB for violating Doe’s due process with a suspension that was “unlimited in both duration and scope,” and for doing nothing more in 200 days of investigation than interviewing Doe. The university’s behavior after Anderle’s spring 2017 order explains why the judge did not make it pay more than $4,714.91 to cover Doe’s court costs. After an administrative hearing more than a year later, UCSB’s Interpersonal Violence Appeal Review Committee agreed with Doe that his evidence and witnesses were “unreasonably excluded” throughout the adjudication. “This constitutes a procedural error that materially affected the outcome in that the investigation was not thorough,” according to the committee’s April 18 decision. 'This constitutes a procedural error that materially affected the outcome in that the investigation was not thorough,' according to the committee’s April 18 decision. The committee voted unanimously to overturn the findings against Doe and “modify” his punishment. Because Doe allegedly got what he wanted – 629 days after his initial suspension, as Ottilie emphasized – Judge Anderle declared the case moot. But Anderle’s order notes the toll that the proceeding took on Doe. UCSB blocked him from campus after winter quarter 2018 because of “his inability to complete sufficient credits, which Doe says is because of his depression” that stemmed from the ordeal. MORE: Judge ordered UCSB to reconsider ruling. It copied and pasted old ruling. Much of the Aug. 7 order concerned the “semantic argument” that Doe still has a record that can be expunged. The answer would be the same if they asked about interim suspension because of Anderle’s 2017 order, the judge wrote, and he can’t force UCSB to violate its recordkeeping obligations to the Department of Education. It’s not enough that Doe’s case “raised awareness” of UCSB’s due-process violations around campus and Santa Barbara, and “exposed conduct” to the University of California regents and Legislature, Anderle said, quoting Doe’s request. Doe had also argued that the public interest was served because one of the officials in his proceeding, Sandra Vasquez, was outed for her behavior shortly after taking a new job at Pomona College. The student filed the lawsuit to “pursue and protect his own rights and interests” in continuing his education, the judge wrote. Ottilie emphasized UCSB’s bad behavior in the release, noting the court had found it “failed to even initiate a meaningful Title IX investigation for months.” The university took 19 months to exonerate his client despite offering no evidence of his guilt. The lawyer believes the Second District Court of Appeal, which also overturned Anderle’s initial order denying the injunction, will give Doe his sought relief because of UCSB’s poor track record in court. Two weeks before Anderle denied Ottilie’s sought attorney’s fees, the appeals court ruled that UCSB withheld “even a semblance of due process” from another accused student, whose accuser may have hallucinated the alleged sexual assault. Around the same time Anderlie declared the case moot, another judge held UCSB in contempt of court for ignoring her ruling that required it to reconsider a stalking finding. Ottilie wrote that this “pattern of cases” should draw wider attention – from current and prospective students, parents and lawmakers. “Somebody needs to be held accountable as the same players (Chancellor, Vice Chancellor, and General Counsel) have all been here for all three of these cases,” he said. UCSB did not respond to a request for comment from The College Fix. MORE: Will UCSD keep hiding witnesses that could prove students innocent? Jeremiah is a senior at Franciscan University of Steubenville, where he is majoring in journalism and minoring in human life studies. 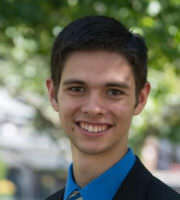 He has served on the student government as a senator. A fluent Spanish speaker, he also regularly contributes to Red Alert Politics, The Rouser and toddstarnes.com.